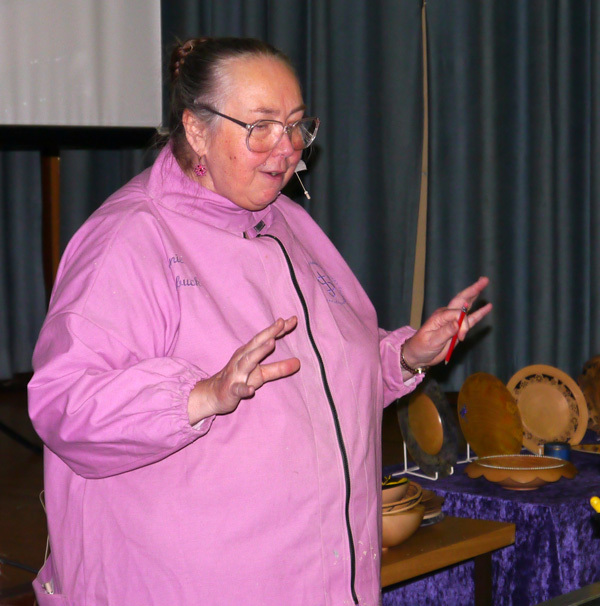 Jennie, from Surrey Woodturners, is a regular visitor and can be relied upon to give an interesting presentation packed with ideas. 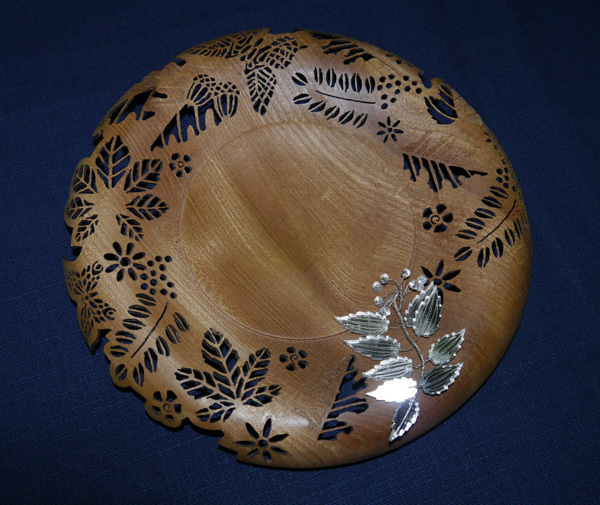 She borrows materials and techniques from numerous unrelated crafts and applies then to her woodturning. Some things she does would bring a frown to the faces of traditionalists but she certainly gives anything a try. 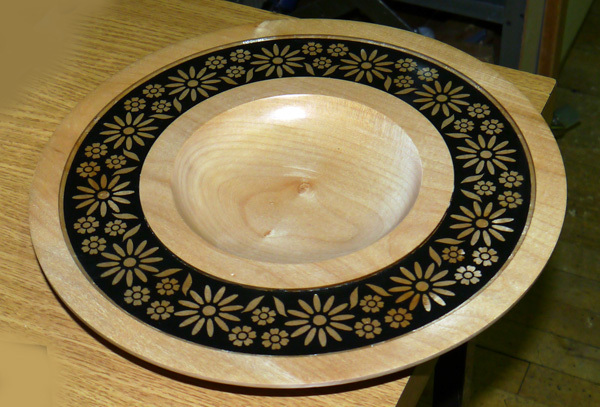 Often the results are most attractive, converting a plain turned item into something special. 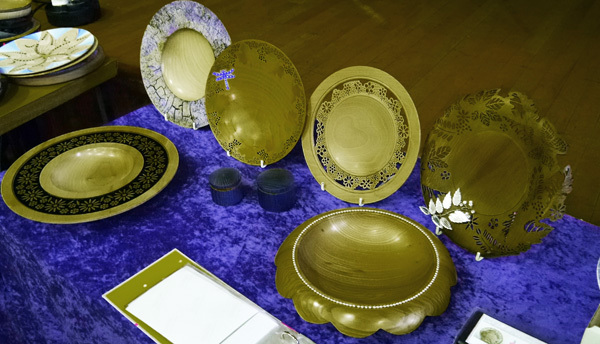 It was only possible for her to give a taste in a couple of hours, but Jennie has kindly offered to send details of her methods, tools and materials to any member who asks on jennie@artycraftywoodturning.com. I have copies and confirm that they are very comprehensive. Jennie’s lathe is a cheap one modified by engineer hubbie Chris to produce smooth running with lots of torque. Chris is also responsible for the numerous tools and jigs she uses. Do you rent him out, Jennie? Her favourite turning tool is a Hamlet bowl gouge with a fairly normal grind. For her type of work she doesn’t like the more extreme ground back wings currently in vogue. She uses a Tru Grind jig for sharpening, considering it worth the outlay for speed and consistency. Her starting point is often a shallow bowl or platter but if intended for piercing e.g. with a burr on a Dremel tool, it has to be thin (as little as 1mm) requiring special care to cope with vibration. She had a few tips to deal with this. Firstly, leave a thicker bead right at the edge when turning a thin rim to give extra support. Vibration is usually speed sensitive so try going faster. Take very small cuts maybe with a larger tool. Try shear scraping. Hold a pad against the back of the bowl to act as a damper. Holding this and the tool on the rest at the same time needs a bit of practice. For this and other operations she advocates taking time merely to practice rather than trying to make an end product as most of us do. A common starting point for many forms of decoration is to make a groove or recess which can be filled with polyester casting resin. The resin can be clear or loaded with dye or metal powder. 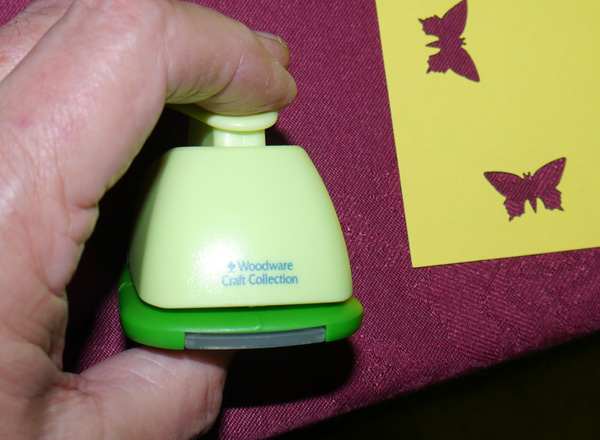 It can be used to encapsulate thin items cut from wood or card etc or coloured granules. I particularly liked her platter with a black card ring encapsulated in the rim, the card having cut outs of various shapes. Simple punches are available in craft shops to cut a large variety of shapes from card. Almost anything can be encapsulated in the resin though it may need sticking in place to prevent it floating up before becoming set. This includes coins or natural items like leaves or flower petals. It is a good precaution on light wood to seal the wood with acrylic sanding sealer before pouring coloured resin to prevent it bleeding through the pores. When using casting resin you always mix more than you use. A useful tip is to pour the excess each time into a plastic cup where it will set. The resulting block of various coloured resins can then be used as a turning blank. The resin surface can be cut, sanded and polished as wood but it might be harder or softer than the wood so it is best to try not running the tool or sandpaper cross the boundary. When applying spray paint, stickers can be used as masks or stencils. If you carefully go round the outline with a pyrography tool it will seal the edge and prevent paint bleeding through the wood. I’m sure I only got a fraction of that but if it has whetted your appetite remember Jennie will send you all the details. Finally Jennie reviewed the members’ gallery which as usual had some very nice items but rather too few. We all love to see what others are making so how about some more work on the table? Pictures of all the gallery items can be seen on the website.